As a healthcare professional, you can use the knowledge gained from genetic testing to educate your patients and take action to potentially reduce their risk of disease, diagnose it earlier or provide more informed and personalized treatment. More than 2 million patients have benefited from Myriad’s Hereditary Cancer testing. At Myriad, we are committed to providing the highest-quality laboratory testing and delivering accurate, clinically actionable results to help you make better, more informed decisions. The Myriad myVision™ Variant Classification Program enables us to provide unmatched variant classification so that that your patient’s genetic testing results are as accurate as possible, reducing uncertainty for patients and their families, and increasing your confidence in providing treatment recommendations. Download Myriad’s Quality Assurance White Paper. Approximately 10 percent of all cancers are hereditary. Patients with a hereditary cancer syndrome are at a significant risk for developing an initial cancer and a second primary cancer. Hereditary cancer is more prevalent than might be expected. In fact, there are very likely patients in your practice who carry the genetic mutations responsible for increased cancer risk. Identifying these patients through appropriate testing can potentially lead to improved treatment options, more appropriate plans for risk management, and, ultimately, better outcomes. 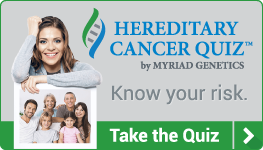 On this site and MyriadmyRisk.com, you will find comprehensive information on the most common hereditary cancer syndromes, and why inherited mutations in certain genes can lead to increased risk for breast, ovarian, colorectal, endometrial, gastric, prostate and pancreatic cancers and melanoma. You also will learn how to identify the familial patterns associated with hereditary cancer, and the appropriate processes for applying the powerful diagnostic tool of genetic testing. *Based on internal validation data.